The Little Ship Club in London will be hosting a competitor and sponsor conference in London on 15th December with the media invited to meet those taking part. Don McIntyre, the Race founder will also be introducing members of his race management team and setting out the Race Rules in greater detail. Like the original Sunday Times event, the 2018 Golden Globe Race is very simple. Depart Falmouth, England on June 14th 2018 and sail solo, non-stop around the world, via the five Great Capes and return to Falmouth. Entrants are limited to use the same type of yachts and equipment that were available to Robin Knox-Johnston in that first race. That means sailing without modern technology or benefit of satellite based navigation aids. Competitors must sail in production boats between 32ft and 36ft overall (9.75 - 10.97m) designed prior to 1988 and having a full-length keel with rudder attached to their trailing edge. These yachts will be heavily built, strong and steady, similar in concept to Robin's 32ft vessel Suhaili. In contrast to the current professional world of elite ocean racing, this edition travels back to a time known as the 'Golden Age' of solo sailing. Suhaili was a slow and steady 32ft double-ended ketch based on a William Atkins ERIC design. She is heavily built of teak and carried no computers, GPS, satellite phone nor water-maker, and Robin completed the challenge without the aid of modern day shore-based weather routing advice. He had only a wind-up chronometer and a barograph to face the world alone, and caught rainwater to survive, but was at one with the ocean, able to contemplate and absorb all that this epic voyage had to offer. 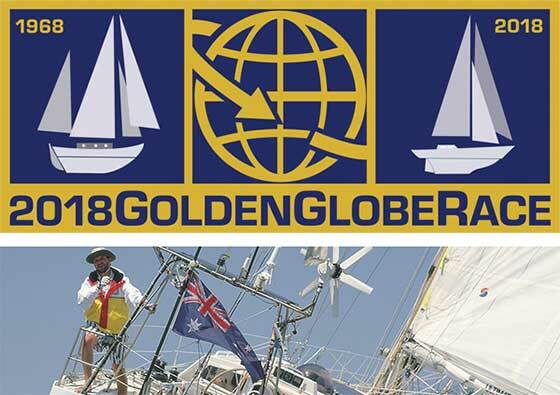 This anniversary edition of the Golden Globe Race is a celebration of the original event, the winner, his boat and that significant world-first achievement. Competitors in this race will be sailing simple boats using basic equipment to guarantee a satisfying and personal experience. The challenge is pure and very raw, placing the adventure ahead of winning at all costs. It is for 'those who dare', just as it was for Knox-Johnston. They will be navigating with sextant on paper charts, without electronic instruments or autopilots. They will hand-write their logs and determine the weather for themselves. Only occasionally will they talk to loved ones and the outside world when long-range high frequency and ham radios allow. It is now possible to race a monohull solo around the world in under 80 days, but sailors entered in this race will spend around 300 days at sea, challenging themselves and each other. The 2018 Golden Globe Race will be a fitting tribute to the first edition and it's winner, Sir Robin Knox-Johnston. The yachts will be tracked 24/7 by satellite, but competitors will not be able to interrogate this information unless an emergency arises and they break open their sealed safety box containing a GPS and satellite phone. Doing this however, has consequences. By breaking the seal, competitors will be deemed to have retired from the Golden Globe Race, and instead will be relegated to the Chichester Class as if they had made a stop. Coverage for the Golden Globe Race has been massive, yet each day more sailors are finding out about this 'Real Solo Race' around the world. Some cannot sleep! The pull is irresistible. What can they do? A dream is borne and now the entry list is nearly full. For those with passion and commitment to compete, The path is clear. They must join the WAIT LIST. There will only be a maximum of 15 on this list. It is the last chance.The organisers expect some of the current provisional entries will not make it to the start line. That is the way with history for any great endeavour, but when one drops out, this gives a chance for another to join. In addition, five Special Invitations have yet to be offered. These will to deserving sailors nearer to the start and those still hanging in on the wait list will be remembered. We may eventually see a fleet of 30 sailors set out from Falmouth on June 14 2018.